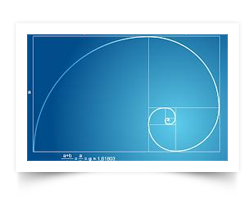 ACM was founded on the principle of the golden ratio. The Company started with few resources and one location. Expansion was based on having a strong technical base to support new and additional resources and locations as they became viable. If a golden ratio rectangle is divided into a square and a rectangle, the smaller rectangle repeats the same proportion. If the smaller rectangle is divided again, the same is true of the yet smaller rectangle, and so on. If corresponding points on the rectangles are joined in the way pictured above, the result is what mathematicians call a logarithmic spiral – exactly the same spiral as the shell of the nautilus. The Nautilus shell is a proven shape of growth and strength. Such patterns driven by the golden ratio are a reflection of order, careful design and predictable structure that leads to advancement and fortitude. These same qualities represented by our logo give us a focus to establish effective project control standards and help others attain order and stability in their project results. Learn More About the Golden Ratio.